Not of it. : Does Houston need its own Dan Gilbert? Does Houston need its own Dan Gilbert? When I tell people that I live in Houston, people sometimes raise an eyebrow. They might scoff at the fact they know it is hot and humid here for most of the year. And they note that the oil industry seems to have created a perception that Houston is a bit dirty with industry. And, don't get me started on the number of people that (rightfully so) criticize the sprawling nature of the city, and the resultant automobile dependency that plagues its residents. Let's face it; Houston's downtown is not where most people want to spend a ton of time... At least not yet. I'm hopeful this perception changes, because there are some great opportunities, and some existing gems downtown. But the perception may not go away if Houston is without a vision, or more importantly a visionary, for what downtown can become. Downtown Houston is becoming a city of glass-walled buildings. We should be thankful that there is a great deal of development downtown, but the result has largely been a lack of character and a homogeneous glass facade at the street level. It's fairly sterile; the equivalent of an architectural hospital. No one feels warm and cozy in a hospital. Who in Houston will call for continued use of existing buildings, and who will be a developer that will lead with designs that foster further development in downtown Houston? Much of Houston's recent development is inaccessible to many. There are various corporate headquarters, but little street-level retail in the Skyline District. Groups like Central Houston and the Urban Land Institute have admirable plans that call for more retail downtown, but these only work if a developers are willing to take risks and make a name for themselves for the wealth of the city, not just that of their own pockets. This concept is not lost on Dan Gilbert, the Quicken Loans founder who is helping to revitalize Detroit building by building. His work in Detroit cannot be understated. One question to ask is whether developers in Houston will be willing to risk development on the many surface parking lots that take up a fair share of downtown, especially on the southern boundary of the downtown core. It has also been encouraging to see the development of the JW Marriott at 806 Main Street in downtown Houston, without need for total demolition, as well as a few other buildings planned to take the place of surface lots. Downtown Houston is also losing a great deal of historical buildings that help shape the character of our city. We lost the Macy's building last year, and now the Texas Tower at 1016 Texas is coming down slowly but surely. Yes, many of these old buildings need to come down because of structural deficiencies, but there is something to be said for companies and individuals that actually recognize the value of architecture and the effect that design and the built environment has on the energy of a city. And by energy, I don't mean crude oil or natural gas. I mean creative, social, culinary, artistic and entrepreneurial energy. In Detroit, an oft-used comparison to Houston because of the lack of diverse industry, Dan Gilbert is leading a charge to preserve many of the city's architectural gems. Gilbert is a Michigan native, and Michigan State University graduate, who has made a dedicated effort to attracting businesses to downtown Detroit. He's a big booster of Detroit. And his efforts are working. Many young professionals are now choosing to live in Detroit to be close to work. Gilbert knows this is what young people want. He knows that young, educated professionals want to spend their time in a "cool urban core in a hip city." In turn, companies are relocating from Metro-Detroit's suburbs to downtown. Gilbert now owns at least 40 properties within downtown Detroit, and hasn't demolished any of them yet. And still, high-tech companies are occupying them, even without fancy shiny glass facades. Dan Gilbert knows the value of architecture, and knows the value of urban aesthetics, especially for the next generation of leaders. He's putting his mark on downtown Detroit. Currently in Houston, developers are making their mark, but seem disengaged in the overall goal of revitalizing downtown Houston. The group that may have the most impact is the restaurateurs of Houston. As chronicled in the most recent Downtown Houston quarterly, their redevelopment of buildings along Main Street, Congress Avenue, and surrounding Market Square has delivered the most accessible and immediate results. For that, they should be commended. They're taking large risks, and are finding that it has paid dividends. They are not the saviors of Houston, but they are accepting a responsibility and showing a commitment that few others would dare to make concerning the economic and cultural health of the City of Houston. 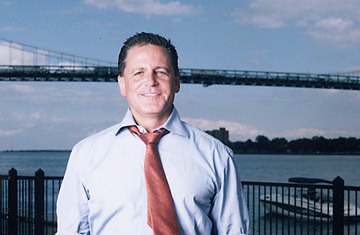 I would hate to play Monopoly with Dan Gilbert. Or Sim City. Or Settlers of Catan. He'd beat us all. Who in Houston will step up and be our Dan Gilbert? 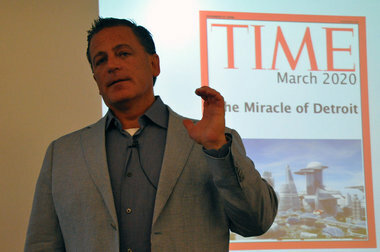 Read more in the Detroit Free Press about Dan Gilbert and his focus on architecture and design in Detroit.